Presented with Arizona State University. 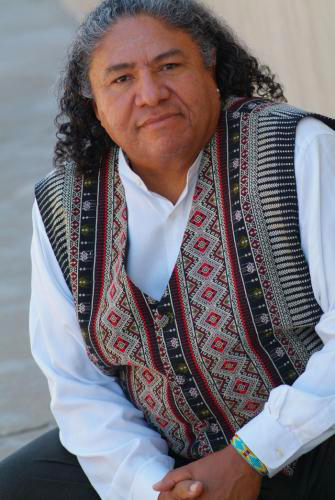 Hear public artist Edgar Heap of Birds (Cheyenne/Arapaho) speak on the topic, Heads Above Grass, Provocative Native American Public Art and Studio Practice, as he delivers the Simon Ortiz/ Labriola Center Lecture on Indigenous Land, Culture and Community. The semi-annual lectures are held at the Heard, which co-presents them with Arizona State University. Named a USA Ford Fellow in 2012, Professor Heap of Birds teaches in Native American Studies at the University of Oklahoma in Norman, Okla., where he has been since 1988. His seminars explore issues of the contemporary artist on local, national and international level. His works include multi-disciplinary forms of public art messages, large scale drawings, Neuf Series acrylic paintings, prints, works in glass and monumental porcelain enamel on steel outdoor sculpture.